Click this link to sign up for the Boston Kokikai Aikido Beginner's Program! Click this link for Membership and Joining Information! "The exercise brings my mood up so that I'm happy most of the time and it gives me energy. And I think the moves are amazing." 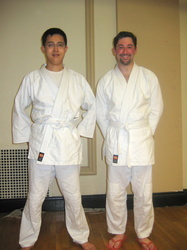 A six-week program providing an overview of basic Aikido skills. necessary skills to fully participate in ongoing Aikido training. you to come and try this art in a safe and inspiring environment. Contact us for more details on the Intro to Aikido Program. Questions? Click this link for our Beginner's Course FAQ! Fill out this form to sign up for the Beginner's Course!